"Clacton" redirects here. For other uses, see Clacton (disambiguation). Clacton-on-Sea is the largest town in the Tendring peninsula and district in Essex, England, and was founded as an urban district in 1871. It is a seaside resort that saw a peak of tourists in the summer months between the 1950s and 1970s. The town's economy continues to rely significantly on entertainment and day-trip facilities and it is strong in the service sector, with a large retired population. The north-west part of the town has two business/industrial parks. In the wider district, agriculture and occupations connected to the Port of Harwich provide further employment. It is located between Jaywick and Holland-on-Sea along the coastline and Great Clacton to the north. The relevant local authority is Tendring District Council. It is at the south-eastern end of the A133. The resort of Frinton-on-Sea is nearby to the north-east. Clacton has a pleasure pier, arcades, a golf course, caravan parks and an airfield. The town and its beaches are still popular with tourists in the summer and there is an annual entertainment programme including the Clacton Carnival, which starts on the second Saturday in August and lasts for a week. Clacton Airshow, an aerial display, takes place on the Thursday and Friday before the August Bank Holiday, with historic and modern aircraft such as the Lancaster, Spitfire, Hurricane, Harrier, Jaguar, Tornado, and helicopters. There are also wing-walkers and the Red Arrows. 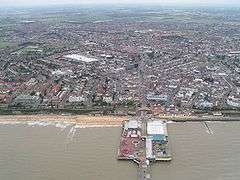 Clacton has a shopping area with many of the usual national chains represented, and a Factory Shopping Village in the north of the town. Clacton has two theatres, the West Cliff Theatre and the Princes Theatre. The West Cliff is one of the last theatres in the country to put on an old-style summer show. Clacton was a site of the lower Palaeolithic Clactonian industry of flint tool manufacture. The "Clacton Spear", a wooden (yew spear found at Clacton in 1911 and dated at 450,000 years ago, is the oldest such spear to have been found in Britain. Great Clacton was founded by the Celts around 100 BC. There are some vague traces of Romans using the Clacton area as a seaside resort. The name Clacton dates from around AD 500, when the area was settled by Saxons. The original name, Claccingaton, means "the village of Clacc's people". The Domesday Book records the village as Clachintuna. The modern day Clacton-on-Sea was founded by Peter Bruff in 1871 as a seaside resort. Originally the main means of access was by sea; Steamships operated by the Woolwich Steam Packet Company docked from 1871 at Clacton Pier which opened the same year. The pier now offers an amusement arcade and many other forms of entertainment. People who wanted to come by road had to go through Great Clacton. In the 1920s, London Road was built to cope with the influx of holidaymakers. Later, in the 1970s, the eastern section of the A120 was opened obviating the need for Clacton visitors to go through Colchester. Today Paddle Steamer Waverley operates from Clacton Pier offering pleasure boat excursions. 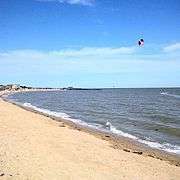 Clacton has one of only seven Blue flag beaches in the East of England at Martello Bay (two more are locally at Dovercourt Bay & Brightlingsea). Other beaches have also been awarded the Seaside Award for 2013 (formerly Quality Coast Award) at West Beach and again at Martello Bay. Clacton Seafront Gardens which run along the top of the seafront west of Clacton Pier has also been awarded a Green Flag and includes various sections with formal gardens, memorials and places to sit and rest away from the hustle bustle of the beach. In 1936, Billy Butlin bought and refurbished the West Clacton Estate, an amusement park to the west of the town. He opened a new amusement park on the site in 1937 and then, a year later on 11 June 1938, opened the second of his holiday camps. This location remained open until 1983 when, due to changing holiday tastes, Butlins decided to close the facility. It was then purchased by former managers of the camp who reopened it as a short-lived theme park, called Atlas Park. The land was then sold and redeveloped with housing. Clacton has a cricket club and a football team called F.C. Clacton, whose best F.A. Cup performance was the first round. The football team play at the Rush Green Bowl with the bus shelter being the stand for the passionate supporters. The name was derived after someone said it looked like a bus shelter. The club then took bus timetables and stuck them on it, to resemble a bus shelter. The Cricket Club has many grounds around Clacton with one in Holland-on-sea and another where Essex County Cricket Club used to play. Clacton also have a rugby club with teams ranging from under 12s to a first and second team. The first and second teams play in Essex League 1 and train on a Tuesday night at 7 which is held at the rugby club in Valley Road. Before the Industrial Revolution, Clacton's industry mainly consisted of arable farmland. As the Industrial Revolution spread across the country, farmers in Clacton realised that their equipment was obsolete. A steam-powered mill was built in 1867 to replace the windmill, which was eventually demolished in 1918. Nowadays, the town's main industrial area is in the northeast of the town (Gorse Lane Industrial Estate and Oakwood Business Park) which contain a variety of businesses and industrial units. St John's Church is the oldest surviving building in Clacton. It has been suggested that smugglers may have used a tunnel from the coast to the Ship Inn to smuggle goods into the country, but this is discounted by some historians. Clacton Pier was the first building of the new resort of Clacton-on-Sea. It officially opened on 27 July 1871 and was 160 yd (150 m) in length and 12 ft (3.7 m) wide. Originally built as a landing point for goods and passengers, as Clacton was becoming an increasingly popular destination for day trippers, in 1893 the pier was lengthened to 390 yd (360 m), and entertainment facilities added. Bought by Ernest Kingsman in 1922, it remained in the ownership of the Kingsman family until 1971. In March 2009 the pier was purchased by the Clacton Pier Company, who installed a 50 ft (15 m) helter-skelter as a new focal point. A 48 turbine wind farm has been constructed about 4.3 miles (7 km) off the Clacton coast. Clacton has an oceanic climate (Köppen "Cfb") with fairly low precipitation. This makes for pleasantly warm and relatively dry summers (which also enhances the towns popularity as a sea-side town), but also fairly chilly winter days. For the 1961-1990 observation period, Clacton averaged 103.7 days with at least 1mm of rain annually, and just 24.3 air frosts a year- comparable to south west coastal locations. Climate data for Clacton 1961-1990, 16 m asl. Clacton's population increased substantially during the 20th century from 7,456 at the 1901 census to 25,000 in the 1960s, 45,065 in 1991 and reaching over 53,000 by 2001. St Osyth's Teacher Training College occupied several buildings in Clacton, mostly along Marine Parade East, until its amalgamation with the North East Essex Technical College in the late 1970s. The town is served by three secondary schools, Clacton Coastal Academy, Clacton County High School and Tendring Enterprise Studio School. The Colchester Institute has a site on Church Road and Thomas Road. Adult Community Learning, run by Essex County Council, is situated in St Osyth Road. Clacton-on-Sea is located at the terminus of the A133 road which runs between Clacton and Colchester. The town is served by Clacton-on-Sea railway station (90 minutes to London Liverpool Street station) via the Sunshine Coast Line whose two branches (the other runs from Walton-on-the-Naze) converge before Thorpe-le-Soken. The town is served by bus routes operated by First Essex, Hedingham Omnibuses. Termini include Colchester, Manningtree, Harwich and Walton-on-the-Naze. National Express operates coach services to/from London and Liverpool. Clacton also has Clacton Airport, which has been active since its use by the RAF during the Second World War. In the 1990s, the airfield was featured along with Roly ("The Wing Commander of Clacton") on the BBC television series "Airport". Clacton’s environmental qualities draw on several things: proximity to the sea, its evolution as the resort, its attraction as a retirement area, and its business and trade. The conservation and enhancement of Clacton’s various environmental qualities depends on assessment, evaluation and management. Both Tendring District Council and Essex County Council can advise on heritage and historic buildings. The district also advises on wildlife conservation, and on obtaining grants for managing countryside for public enjoyment and appreciation. The county has an archaeological service. Pat Fletcher, golfer who was born in Clacton-on-Sea but eventually emigrated to Canada. In 1954 he won the Canadian Open and is considered the last Canadian to win that championship. Vivian Woodward, early 20th century footballer, Spurs and Chelsea, England captain, still holds the record for the number of goals scored per international. Frank Vigar, Essex County Cricketer. On the Easter weekend of 1964 rival youth gangs of Mods and Rockers descended upon Clacton-on-Sea. They created mild havoc by fighting with each other. In the British soap opera EastEnders, the characters of Frank Butcher and Pat Harris met at Clacton Butlins in 1958. The music video for "Always on My Mind" by the Pet Shop Boys was filmed in Clacton, which was also the setting for their film It Couldn't Happen Here. ↑ "Town population 2016". City Populations. Retrieved 2 September 2016. 1 2 Laing, Lloyd; Laing, Jennifer (1980). The Origins of Britain. Book Club Associates. pp. 50–51. ISBN 0710004311. ↑ "The Clacton Spear". Natural History Museum. Archived from the original on 28 October 2014. Retrieved 23 October 2012. ↑ "Gunfleet Sands Wind Farm, United Kingdom". power-technology.com. Kable Intelligence Limited. 2015. Retrieved 19 March 2015. ↑ "Clacton 1961-90 averages". Met Office. Archived from the original on 10 February 2001. Retrieved 16 September 2011. ↑ Jessica Berer (May 1985). Sade. Spin. p. 12. Retrieved 21 August 2010. Jacobs, Norman (2002). Clacton Past. Chichester: Phillimore. ISBN 1-86077-225-0. The Clacton Spear. The Natural History Museum. (2012). Retrieved 2012-02-16. Wikimedia Commons has media related to Clacton-on-Sea. Wikivoyage has a travel guide for Clacton-on-Sea.